President Obama takes it personally when Americans disagree with his free-trade fundamentalism. He keeps griping about the Democrats who usually support his agenda but are ardently opposed to his request for “fast track” authority to bypass congressional input and oversight on a sweeping Trans-Pacific Partnership trade deal. 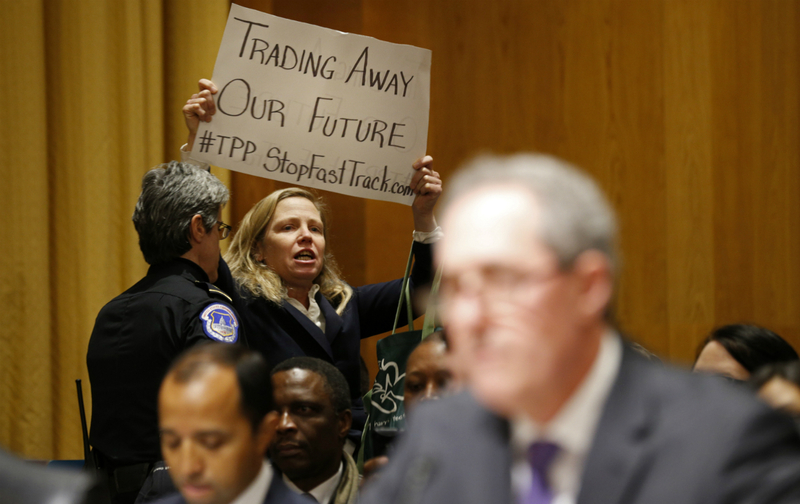 The president has from the start of the debate over fast track and the TPP had a practical problem: If most congressional Democrats align with labor, environmental, and human-rights activists rather than the White House—as they appear intent upon doing— they can block Obama’s trade agenda. In the Senate, just 40 votes are required to erect a procedural barrier to fast-track legislation. In the House, a reasonably united Democratic caucus could align with the significant number of Republicans who have traditionally opposed unrestricted free trade to thwart fast track and/or the TPP itself. The trade fight is not finished; negotiations with Senate Republicans who favor Obama’s agenda could make the fast-track proposal more attractive to at least a few wavering Democrats. And if that happens, expect Senate majority leader Mitch McConnell to exercise the option he has retained to bring the issue up again. Unless and until that happens, however, the president has taken a hard hit. It happened because a number of traditionally pro–free trade Democrats, who had been expected to vote with Obama and the Republicans, joined with the Senate’s growing caucus of fair-trade Democrats to block action. This was what the president feared would happen. In the run-up to Tuesday’s vote, the president made no secret of his frustration with his fellow Democrats. “There have been a bunch of critics about trade deals generally and the Trans-Pacific Partnership,” he griped to the crowd that was assembled last week for his appearance at the corporate headquarters of Nike, a US-based firm that (with its contractors) now employs roughly 40 overseas workers for every one American. And, the president explained, a lot of the critics are Democrats who he has traditionally thought of as his partisan and ideological allies. Instead of listening to their objections, however, Obama simply announced that he was right and the Democrats who have backed him on so many other issues were wrong. The problem is that the “evidence” the president has mustered on behalf of fast track and the TPP is unconvincing. In part that’s because, as Bernie Sanders warned with regard to proponents of free-trade deals during Tuesday’s Senate debate, “These folks have been proven wrong time after time after time.” But there is also the fact that the current promises are so hollow. Consider the case of Nike and that 40-1 ratio. Even if every promise about the benefits of free trade and the TPP were to come true—an exceptionally unlikely prospect if the history of trade pacts is any guide—the ratio of overseas workers to Americans employed by Nike and its contractors would shift to somewhere in the range of 30-1. That best-case scenario, everyone admits, would take more than a decade to be achieved. And, though fewer admit it, much of the new employment would likely involve technical workers developing automated production schemes that reduce rather than increase living-wage employment in the US and abroad. Obama’s criticisms of fellow Democrats, which became more and more intense as Tuesday’s Senate vote approached, disregarded not just the honest concerns of Democratic members of the House and Senate but the sincere objections of union members, environmentalists, civil-rights, and human-rights activists. Ultimately, the president’s approach harmed his own credibility, as his comments created the impression that he was unaware of the long experience, and the deep insight, possessed by progressive critics of free-trade absolutism. The largest and steadiest public-education project on a major economic issue in modern history has played out over the past quarter-century in union halls and church basements and community centers across the country, as Americans have wrestled with the promises and realities of trade policy. The people the president keeps saying are “wrong”—a group that includes Senate minority leader Harry Reid, Massachusetts Senator Elizabeth Warren, Sanders and most House Democrats—are not unthinking protectionists or crude isolationists. They are supporters of workers, the environment, and human rights in the United States and abroad. They have come to recognize that, while fair trade holds immense promise, free trade along the lines the United States has practiced it in recent decades has done immense damage. Now Obama suggests that those he sided with in 2008 are clueless in 2015. “American workers have seen the effects of unfair foreign trade on their jobs and manufacturing facilities—they don’t need their elected leaders making personal attacks on each other during an important policy debate,” says Ohio Senator Sherrod Brown, a Democrat who remembers when Obama stood with the critics of failed free-trade policies. It is not ignorance but experience that has caused so many progressive members of Congress to join activist groups that have developed deep expertise on trade policy to oppose the president’s embrace of the trade agenda of Senate majority leader McConnell and House Speaker John Boehner. Major unions have developed research teams to study trade and worked closely with experts on trade policy for decades now. They have also aligned with international trade unions to oppose the free-trade absolutism of the president and his Wall Street backers. Labor’s opposition to fast track and a TPP deal that the Communications Workers of America union refers to as “NAFTA on Steroids” is driven by fact—not fantasy. The president has every right to side with Wall Street in trade debates. But he does his cause no favors by suggesting that those who sincerely disagree with him are unaware of what is at stake. In fact, the reason they are opposing Obama’s fast-track request is because they know precisely what is at stake.